Rhea americana, the rhea, is a new world representative of the ratite birds, a group that includes the extant ostrich, emu, kiwis, and cassowaries as well as the extinct moas and elephant birds. None of the species allocated to Ratitae are able to fly. Some, such as the ostrich and emu, are cursorial (runners); however, the kiwis and cassowaries live in densely forested areas. Although morphologically diverse, the ratites are connected by a number of synapomorphies including a fused coracoid and scapula, the trochlea of metatarsi II of the tarsometatarsus is not plantarly deflected and the distal end does not reach farther distally than the distal end of the trochlea of metatarsi IV, the musculus flexor hallucis longus to the hallux is either weak or absent, and the oil gland is only minutely tufted or naked (Mayr and Clarke, 2003). The ratites belong to the more inclusive clade, Palaeognathae, a taxon that also includes the tinamous, a group of birds that unlike ratites is able to fly. Historically, the palaeognaths were grouped together based on the morphology of their palate (‘dromaeognathous’ or, more commonly referred to as the ‘palaeognathous’ palate; Huxley, 1867; Pycraft, 1900). The features that comprise the palaeognathous palate are a broad vomer that unites rostrally with the broad maxillopalatine plates and caudally with both the palatines and the pterygiods, the lack of an articulation between the pterygoids and the parasphenoidal rostrum, basipterygoid processes that project from the body of the basisphenoid/parasphenoid complex rather than the parasphenoidal rostrum, the basisphenoidal processes articulate with the pterygoids near the distal ends of the pterygoids, and a single head to the quadrate (Huxley, 1867). In addition to these palatal characters, other morphological features unite Palaeognathae: a marked furrow just rostral of the nasal opening on the upper beak, rostral extension of the mesethmoid beyond the naso-frontal hinge, two strong grooves on the ventral surface of the mandibular symphysis, a flat dorsal surface of the mandibular symphysis, three to four costal processes on the sternum, and a greatly reduced or no hallux (Mayr and Clarke, 2003). Monophyly of Palaeognathae, although historically disputed, is supported in recent morphological, molecular, and total evidence studies (Cracraft, 1974; Bledsoe, 1988, Härlid et al., 1997, 1998, 1999; Cooper et al., 2000; Livezey and Zusi, 2001, Mayr and Clarke, 2003). There are two living species allocated to Rheidae, whose fossil record extends back into the Eocene. The extant members include Rhea americana (greater rhea) and Pterocnemia pennata (lesser rhea), both of which are restricted to South America. The greater rhea ranges across the eastern expanse of the continent, and the lesser rhea is found isolated in southeastern-most South America and also along the western edge of the continent. Although not the largest bird (this distinction is given to another ratite the ostrich, Struthio camelus), the greater rhea is the largest amongst South American birds. This specimen (TMM M-6721), a juvenile, came from the Rockin' W Ranch in Dripping Springs, Hays County, Texas. The sutures are clearly visible on the skull itself and many of the bones are not yet fully ossified. In particular, the bones of the palate are not fully ossified and show up as wisps of bone in the scan because of the lack of ossification. This project was started in the Digital Methods for Paleontology course at The University of Texas at Austin. Funding for scanning was provided by a National Science Foundation Digital Libraries Initiative grant to Dr. Timothy Rowe of The University of Texas at Austin. This specimen was scanned by Matthew Colbert on 6 February 2001 at the University of Texas High-Resolution X-ray CT Facility. The Rhea americana data set was processed using Adobe Photoshop 6.0, Adobe Illustrator 9.0, NIH Image 1.62 and File Buddy 6.0.5. The first step involved reducing the images from 16 bit to 8-bit format using Adobe Photoshop. (because the images had originally been generated in 12 bit format on the scanner and were packaged in 16 bit format.) Levels were adjusted to 0/1.00/15 to drop the data to the 8-bit format. The next step was to relevel the images to make the image clearly visible. The input grayscale levels were changed to 61/1.53/255. The images were then re-sliced along the horizontal and sagittal axis planes using a calculated inter-slice spacing of 2.54 pixels for the input spacing and 1.00 pixels as the output. This resulted in 429 horizontal slices and 412 sagittal slices. The images were labeled with numbers using File Buddy by deleting the name and tiff extension and changing the numbers starting at 001. The numbers were then drawn onto the files using NIH Image. The bones of the skull and first two vertbrae were then labeled using Adobe Illustrator. The slices were then run through a batch process in Abode Photoshop to generate TIFF files. These files were then reduced to web size using Photoshop and converted to JPEG format using IrfanView. Baumel, J. J. (ed.). 1993. Handbook of avian anatomy: Nomina anatomica avium, Second edition. Publications of the Nuttall Ornithological Club. 779pp. Bledsoe, A. H. 1988. A phylogenetic analysis of postcranial skeletal characters of the ratite birds. Annals of Carnegie Museum 57:73-90.
Cooper, A., C. Lalueza-Fox, S. Anderson, A. Rambaut, J. Austin, and R. Ward. 2000. Complete mitochondrial genome sequences of two extinct moas clarify ratite evolution. Nature 409:704-707. Cracraft, J. 1974. Phylogeny and evolution of the ratite birds. Ibis 116:494-521. Davies, S. J. J. F. 2002. Ratites and Tinamous. Oxford University Press, Oxford, 310 pp. Härlid, A., A. Janke, and U. Arnason. 1997. The mtDNA sequence of the ostrich and the divergence between paleognathous and neognathous birds. Molecular Biology and Evolution 14:754-761. Härlid, A., A. Janke, and U. Arnason. 1998. The complete mitochondrial genome of Rhea americana and early avian divergences. Journal of Molecular Evolution 46:669-679. Härlid, A., A. Janke, and U. Arnason. 1999. Analyses of mitochondrial DNA nest ratite birds within the Neognathae: supporting a neotenous origin of ratite morphological characters. Proceedings of the Royal Society of London, B, 266:305-309. Harvey, E. B. et al. 1921. An atlas of the domestic turkey. U.S. Atomic Energy Commision. 247pp. Heilmann, G. 1972. The Origin of Birds. Dover Publications, Inc. New York. 209pp. Huxley, T. H. 1867. On the classification of birds; and on the taxonomic value of the modifications of certain of the cranial bones observable in that class. Proceedings of the Zoological Society of London 1867:415-472. Koch, T. 1973. Anatomy of the Chicken and Domestic Birds. The Iowa State University Press. 170pp. Livezey, B. C., and R. L. Zusi. 2001. Higher-order phylogenetics of modern Aves based on comparative anatomy. Netherlands Journal of Zoology 51:179-205. McDowell, S. 1948. 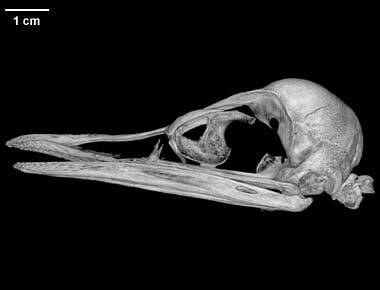 The bony palate of birds. Part I. The Palaeognathae. The Auk 65:520-549. Parker, W.K. 1866. On the structure and development of the skull in the ostrich tribe. Philosophical Transactions of the Royal Society of London 156:113-183. Proctor, N. S., and P. J. Lynch. 1993. Manual of Ornithology, Avian Structure and Function. Yale University Press. 340pp. Pycraft, W. P. 1900. On the morphology and phylogeny of the Palaeognathae (Ratitae and Crypturi) and Neognathae (Carinatae). Transactions of the Zoological Society of London 15:149-290. Saiff, E. I. 1983. The anatomy of the middle ear region of the rheas (Aves: Rheiformes: Rheidae). Historia Natural (Argentina) 3:45-55. Webb, M. 1957. The ontogeny of the cranial bones, cranial peripheral and cranial parasympathetic nerves, together with a study of the visceral muscles of Struthio. Acta Zoologica 38: 81-203. Zusi, R. 1993. Patterns in diversity in the avian skull; pp. 391-437 in J. Hanken, and B. K. Hall (eds. ), The Skull, Volume 2- Patterns of Structural and Systematic Diversity. The University of Chicago Press. 566pp. To cite this page: Dr. Amy Balanoff, 2001, "Rhea americana" (On-line), Digital Morphology. Accessed April 19, 2019 at http://digimorph.org/specimens/Rhea_americana/.